Yay - it's Friday! Time for more chocolate! I'm on the road today, arriving in MT by evening. Don't worry - I'll be sure to find some chocolate on the way - LOL! 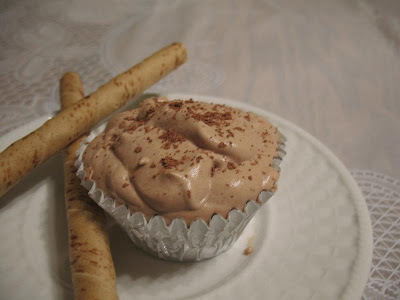 I decided to rerun a post for you since I finally have a picture for the recipe. I made this dessert just recently for company. And this time, since the dessert was for grownups, I did make it with Amaretto! I think all of you will really like this recipe. I found it long ago on the internet through Betty Crocker. It's sooooo easy and elegant, too! It's a favorite of mine to serve to company - super easy, can be made ahead, and looks and tastes impressive. And no baking - no extra heat in your summer-time house. 1. Beat whipping cream in chilled bowl with electric mixer on high speed until stiff. Fold in liqueur (or Italian syrup) and chocolate syrup. 2. Spoon into 8-10 paper-lined foil cupcake liners (can mound up higher than edge as much as possible). Cover and freeze at least 4 hours but no longer than 48 hours. Place in refrigerator 15 minutes before serving. Sprinkle with cocoa. Makes 8-10 servings. Can easily cut recipe in half. Make sure to use the foil cupcake liners - they really add to the elegance. It's really nice to serve these with some nice chocolates on the side or those Pirouline cookies. I hope you try this recipe - it really is so simple. 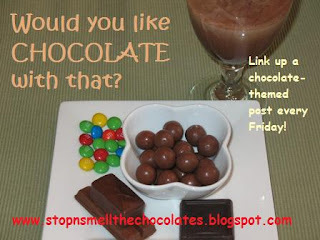 Now YOU - yes, YOU - should link up a chocolate post right here with Mr. Linky! Chocolate should be shared, don't you think? You can find an old post or write a new post and come back to link up! That looks really really yummy. I never know where to buy the flavored liqueurs so I never make these things. Where in the grocery store would I find them? That looks great, and who can argue with a dessert that's easy to make?! Thank sounds nice and easy!! Another yummy looking recipe to save! This looks really easy! Keep 'em coming! Looks yummy as usual my friend! Hope you have a great time in MT. Oh and I love your new phone. Too cute!